Published also in: I. Galanaki, H. Tomas, Y. Galanakis and R. Laffineur (eds. ), Between the Aegean and Baltic Seas: Prehistory across Borders. Proceedings of the International Conference Bronze and Early Iron Age Interconnections and Contemporary Developments between the Aegean and the Regions of the Balkan Peninsula, Central and Northern Europe, University of Zagreb, 11-14 April 2005, Aegaeum 27 (2007) 3-21. In the last decades the research interest in the study of pre-Mycenaean contacts of the Aegean region with the geographical zones to the north and west has considerably diminished. While until the early 1970ies there was still much debate going on about aspects like the northern links of cord-decorated pottery or of the origin of the tumuli in Greece, already ten years later such subjects and the whole problem of possible Balkan connections of the earlier parts of the Aegean Bronze Age had almost disappeared as research topics of Aegean Archaeology. The question arises why this was the case. One reason stems from the fact that after the acceptance of scientific dating methods comparative stratigraphy has lost its importance for establishing the absolute chronology of Balkan cultures, which can now be independently dated. Hence, there seemed to be little need to look for cross-links between north and south. But in abandoning the archaeological comparing of material culture it was overlooked that this method is still important, but not so much for chronology as for inferring connections between different societies. Another reason is undoubtedly the language-barrier, since the linguistic diversity of Southeast Europe and the lack of synoptic studies in English do not make it an easy task to familiarize with the prehistory of the Balkans. But I suspect that besides the mentioned points the described decline in research interest was triggered by more fundamental issues. One of them relates to the fact that the treatment of the subject in the past has been marred by its linkage to diffusionism and migrationism, that is explanatory approaches which since the advent of Processual Archaeology for good reasons have been castigated as methodologically unsound. In the Aegean, migrationism in the last decades has certainly discredited studies on pre-Mycenaean contacts to the North. The simplistic view of hoards of Balkan or Eastern European populations periodically invading and destroying Aegean cultures, and moreover the linkage to the controversial issue of the “Coming of the Greeks” has given a bad name to the whole field of research. Outside of the Aegean, on the other hand, the repercussions of diffusionism have contributed to the diminishing research interest in investigating possible contacts to the Aegean. Understandably, the counter-movement has been strongest in those countries most severely affected in the past by diffusionism. Considering that until the 1960ies achievements of early cultures in the West and Central Mediterranean, like copper metallurgy, fortifications with horseshoe-shaped bastions and Megalithic monuments were all attributed to the influence of Eastern Mediterranean civilizations, it was an important step to counter these claims and to look into the indigenous roots of these phenomena. But in the meantime, these initially refreshing new ideas have themselves become an orthodoxy, which through its emphasis on explaining cultural change in terms of autochthonous social and economical trajectories runs the risk of systematically minimizing or even neglecting the importance of outside stimuli to societies. The Zagreb conference is an encouraging sign that within Aegean Archaeology there exists the wish to go beyond diffusionism and migrationism and to reconsider the importance of Bronze Age and Early Iron Age contacts of the Aegean to the North and West. In the following I will try to outline some of the reasons why I think the subject of this conference should be of prime interest for Aegean Archaeology. Hitherto, scholarly discussions on the impact of expanding trade connections in later prehistory have to a large extent focused on the question of economic links between different groups of peoples and especially on the distribution and mechanisms of exchange of certain raw materials, finished products and technological skills. In such discussions, the knowledge of the “natural” routes of exchange over mountain-passes, through river valleys or over the sea is usually taken for granted, thereby unconsciously transferring today’s so familiar geographical impression of the world to the distant past. But such an attitude confuses cause and effect, inasmuch as the knowledge about the shape and nature of rivers and the sea did not exist from the beginning, but revealed itself through the accumulation of information gained through these very contacts. Moreover, M.W. Helms has reminded us that notions of space and distance are culturally created. The dichotomy between “heaven” and “earth”, that is between horizontal distance as something ordinary and vertical distance as something supernatural for instance, simply does not exist in all societies. Instead, irrespective of the direction to which one moves, the way in which the surrounding world is conceived may often be intimately linked with religious ideas in general and cosmology in particular. Accordingly, any change in knowledge about distant areas was bound to have repercussions on the world views of society at large. The idea of the Mediterranean as a unified and coherent geographical entity which left its imprint not only on nature but also on the ways of living found its permanent expression in the works of F. Braudel. A diametrically opposed position to Braudel was formulated by Y. Shavit, who argued that the presumed unity and uniformity of the Mediterranean is a mere illusion created mainly at the historian’s and geographer’s desks. One does not have to subscribe to the entire consequence of the latter view in order to realize that many elements which seem to be the outcome of similar environmental conditions were in reality spread through human activities. Thus, part of what Braudel saw as the Mediterranean way of living was not imposed by nature on man, but rather by man on nature. This becomes clear, when we turn to one of the hallmarks of Mediterranean unity, namely the “triad” of olive tree, wine and wheat. There is probably no handbook on the Mediterranean which does not refer to the distribution of the olive tree as an example for the uniformity of climate. Indeed, the wild forms of the olive tree, the oleaster, as well as of wine and the fig are all concentrated on coastal regions of the Mediterranean, thus underlining the indisputable link to certain climatic preconditions. However, the domestication of these plants and also of wheat does not seem to have taken place in many regions, but rather specifically in the Near East, from where they were brought to other areas of the Mediterranean. Therefore, the traits usually cited as evidence for the cultural unity of the Mediterranean are the outcome of a multi-layered spatial process brought about by the gradual expansion of interconnections between societies. We can be fairly certain that in the early 1st millennium BC at the latest some sort of geographical concept of the Mediterranean must have existed, because otherwise the waves of Phoenician and Greek colonization to the west could not have been carried out so systematically. The existence of such spatial knowledge is of course amply documented in the Odyssey, and, from this point of view, P. Horden and N. Purcell are right to call this work of literature “the creator of the Mediterranean”. Nevertheless, we have to bear in mind that in antiquity the perceptions of the form and size of the Mediterranean differed significantly from ours. In looking at the Tabula Peutingeriana we realize that in Late Roman times the Mediterranean was conceived as consisting of linear routes defined by sequences of towns, harbours and natural landmarks, like mountains, bays and islands, thus putting the emphasis on the rendering of the mainland and not of the sea. Such concepts of Periplous or “spazio odologico”, as it was called P. Janni, are rooted in the phenomenon of “mental mapping”, that is the creation of cognitive images which chart the relative location of points of special interest to an individual or to society at large. Mental maps reflect a subjective point of view and they are based on the values and ideological conceptions of a particular society at a particular time. Therefore, in our view, such images only give a selective and distorted impression of physical geography and are subject to constant change because they are directly linked to patterns of interaction preferred at that time and to the resulting alterations in the flow of spatial knowledge. Cognitive images of space are nevertheless of extreme importance, since, for instance in the case of the Mediterranean they helped to subdivide the vast expanse of the sea into segments and to create a structure which contributed to a feeling of security amidst the dangers of sea journeys so vividly described in the Odyssey. In summary, I would argue that in order to grasp the real importance of expanding connections between prehistoric societies in the Mediterranean we have to conceive this sea not as a priori existing, but rather as emerging exactly through these activities and the associated changes in spatial concepts. Furthermore, we should bear in mind that the ever-changing perceptions of the surrounding world were tied to cosmological concepts which gave the connections between distant societies of the early Mediterranean a potential ideological significance going far beyond the notion of neutral transactions between partners guided only by economical motives. The geographical knowledge which provided the background for the Phoenician and Greek colonization movements must have been accumulated in the preceding periods of the Bronze Age. In the Mediterranean especially the centuries roughly between 1600 and 1000 BC brought about a new dimension of what Purcell and Horden have called the connectivity of microregions. With this term they designate “…the various ways in which microregions cohere that may range in size from small clusters to something approaching the entire Mediterranean”. The patterns of maritime connectivity which we can observe from the beginning of the Aegean Late Bronze Age spanned already wide parts of the Mediterranean, and they must have found their reflection in mental maps used by the societies participating in the exchange. But the current article will not deal with this advanced stage of interconnections. Instead, I will go back in time to the 3rd millennium BC and argue that what we see in the Late Bronze Age is based on much earlier structures of exchange. Before I will attempt to disentangle the strands of what we know of the earliest periods of Mediterranean connections, I first have to address two pitfalls of interpretation which have to be avoided. The first danger lies in perceiving the increase in knowledge about the Mediterranean and its coasts as continuous and linear. It seems to me, that we are rather confronted with a long-term phenomenon which had ups and downs and in which previously achieved levels of knowledge were again lost. This particularly applies to the earliest phases of the penetration of the Mediterranean, during which, as we will see, wide networks of maritime communication temporarily emerged, but then disintegrated probably because the participating groups lacked the long-term political stability of, for instance, the societies involved in the longue durée of trade relations from the Minoan Old Palace Period until the end of the Mycenaean palatial period. The latter point leads us to the second danger which consists in the temptation of implicitly or explicitly transferring economical and political structures of the 2nd and 1st millennia BC to the distant past, and to use them as blueprints for modelling earlier patterns of connectivity. Above all, it would be a mistake to project North-South- and West-East-divides in social complexity which existed during the 2nd millennium BC to earlier times and to automatically assume that Greece and the Aegean must have had during the entire 3rd millennium BC a more complex social structure and a more elaborate technological and economical level than its neighbors in the Balkans and in the Central Mediterranean. Instead, it is necessary to sketch for each chronological horizon the specific structures of connectivity and the driving forces behind the exchange. As I will try to show, the development of early Mediterranean relations was brought about by the interplay of many groups who pursued their own interests, and the groups with the highest social complexity were not necessarily the ones with the most pronounced maritime mobility. A remarkable example for the fact that the emergence of patterns of maritime connectivity is not tied to high social complexity is the dispersal of farming economy in the Mediterranean. Until not so long a while ago it was believed that the “Neolithic Revolution” spread from the Near East to Europe by land. Nowadays, we know that this was only half of the truth and that especially during the first waves of the diffusion of plant cultivation and animal husbandry in the 7th millennium BC sea-borne movements must have played a decisive role. Due to space constraints I will not tackle the issue of the mechanisms of Neolithization, either through colonisation or through acculturation of Mesolithic populations. The more important aspect in our context is that the first domesticated animals and cultivated plants had to be moved over-sea, irrespective of whether this came about through the movement of peoples or through exchange networks between Neolithic and Mesolithic populations. This brings us to the crucial question of the nature of early Mediterranean sea-craft. It is usually assumed that until the advent of sailing ships shortly before 2000 BC paddled canoes and longboats, like the ones depicted on Early Cycladic “frying pans” and on stones of the megalithic temple of Hal Tarxien on Malta were the only means of Mediterranean sea-craft. C. Broodbank has estimated an average daily travelling radius of a longboat with a full crew of about 20 to 50 km. As however M. Wedde rightly remarked, the first depictions of the sail appearing in EM III already show a fully fledged system based on wind-power. He concludes that evidently “…the Aegean seafarers had perfected their sails before pictorial evidence becomes available”. Thus, the current picture of more than four millennia of technological stagnation in boat-building and then suddenly at the end of the 3rd millennium BC a turnaround with the invention of the sail may be misleading. With these remarks I do not want to imply that there were sailing-boats already during the Early Neolithic. In fact, we do not yet know anything about their shape. At least, thanks to the spectacular new boat representations seemingly dating to the Chalcolithic period from the excavation of Chr. A. Televantou in Strophilas on Andros, we get for the first time valuable insights into types of sea-crafts considerably earlier than the ones from the 3rd millennium BC. According to the preliminary available information ships of different types and size are depicted. This new find underlines the variety of sea-craft used prior to the Early Bronze Age and reminds us that we should not envisage even the Early Neolithic boats as too light and primitive, because, as Broodbank and T.F. Strasser have calculated, heavy loads of peoples, animals and supplies of crops had to be transported. Such boats formed the precondition for the spreading of farming economy first from Anatolia to Crete and Southern Greece and thereafter in the course of a few centuries to other parts of the Mediterranean. It is unknown to what degree these Early Neolithic patterns of connectivity across the Mediterranean were temporarily transformed into more stable exchange structures between Italy, the Balkans and the Aegean. In the long-run, however, they must have disintegrated, and in the millennia following the spreading of agriculture evidence for the continuation of long-distance contacts between East and West in the Mediterranean is lacking. To be sure, there were important Neolithic and Copper Age interregional zones of maritime interaction, for instance for the distribution of Liparian and Sardinian obsidian varieties in the Central and Western Mediterranean and for Melian obsidian in the Aegean, but what is missing are signs for a cross-linking of these separate exchange networks. Revealingly, the first acme of metallurgy during the Balkan and Carpathian Copper Age of the late 5th and the early 4th millennia BC did not affect Italy or other parts of the Central Mediterranean. Even within Southeast Europe prior to the 3rd millennium BC seaborne travel in the Adriatic and Ionian Sea is archaeologically not well attested, and the existing evidence for long-distance contacts in the zone between the Carpathian Basin and the Aegean point to land-routes along the major river valleys. As examples I just want to mention the distribution first of Carpathian obsidian during the 5th millennium BC to the Northern Aegean and secondly of the vessels of the “type Bratislava” during the early Baden culture, in the centuries around 3500 to 3300 BC. A major change in this situation occurred in the beginning of the 3rd millennium BC, and this millennium proved to be of particular significance not only for the emergence of interconnections between different zones of the Mediterranean but in all likelihood also for the increase of spatial knowledge. I will divide my discussion into three chronological horizons. The first from roughly 2900 to 2500 BC, the second from 2500 to 2200 BC and the third from 2200 to 2000 BC. The first horizon leads us back to the time of the Vučedol culture in parts of the Carpathian Basin and the Balkans, contemporary with the later part of EH I and the earlier of EH II in Greece (Pl. V). It is during this time of the early 3rd millennium BC that we find in certain parts of a zone stretching from the West Balkans in the Northwest to Mesopotamia in the Southeast clear evidence of marked social inequality. In exceptionally rich grave assemblages belonging to the Montenegrinian Vučedol culture which derive from the central stone cist-graves of the tumuli of Mala Gruda and Velika Gruda in the Tivat plain near the bay of Kotor as well as from the tumulus of Boljevića Gruda near Podgorica indications for contacts to the south appear. The first link to the Aegean manifests itself, as first M. Primas has recognized, in small golden rings probably all belonging to head ornaments. One of the two types of these rings has close comparisons in the so called R-graves of Steno, an EH II tumulus necropolis on the Ionian island of Lefkas, and therefore Primas has proposed the name “type Lefkas”. It has to be emphasized, though, that in spite of this designation the centre of distribution of such golden rings lies in the Balkans and in the Carpathian Basin, with the pieces from Lefkas being southern outliers within the general distribution and probably representing Balkan imports to Northwest Greece. Since in the R-graves we have clear signs for contacts with contemporary sites in the Peloponnese and the Cyclades, it is not difficult to envisage a maritime route along the eastern coasts of the Adriatic and Ionian Sea and then onwards to the Aegean. From this point of view, other indications for interactions between the Aegean and the Adriatic-Ionian zone should not come as a surprise. I. Papageorgiou has recently drawn attention to a type of golden ring, which is probably related to the “type Lefkas”, but in contrast to the latter is up till now restricted to the Aegean region. This may represent an Aegean emulation of a special object type of Balkan derivation. On the other hand, the golden dagger from Mala Gruda (Pl. Ia:1) is likely to belong to a group of daggers of the EB 2 period in Anatolia, from where it was probably imported to Montenegro (Pl. Ia:1-5, Ib). One of the Anatolian comparisons, a piece from Alaca Höyük (Pl. Ia:5), also consists of precious metal, in this case silver. In addition, silver daggers, albeit of slightly different types are known from Crete. A still open question relates to the extent of early 3rd millennium BC patterns of connectivity to the west and to the north. Currently, I don’t see any unequivocal evidence that groups in Italy participated in the described exchange. That we are nevertheless confronted with the prospect of a much wider impact of these networks is possibly demonstrated by the intriguing appearance of a small Mesopotamian limestone figurine of a type characteristic for the earlier 3rd millennium, which came to light in 1958 in an excavation in Germany, at Weilmünster-Dietenhausen in the central part of Hessen. There is no evidence that the figurine which was found in sediment underneath an Iron Age tumulus was smuggled in by workers, and S. Hansen argues convincingly that it might have reached Central Europe in the early 3rd millennium BC at the time of the Corded Ware culture through exchange networks in the Adriatic-Ionian Region. In support of this conclusion it can be noted, that already at an early stage of the 3rd millennium BC objects of Near Eastern derivation found their way to the west. In addition to the Mala Gruda dagger there is the cylinder seal from Kapros grave D on Amorgos the decoration of which is linked to the Nineveh 5 style of Upper Mesopotamia. The analysis of exceptionally rich grave assemblages and hoards appearing in the zone between the Eastern Adriatic region and the Near East has led Primas and Hansen to infer certain supra-regional structural similarities in the way in which elevated social status was expressed through non-utilitarian objects. This applies for instance to the custom of depositing silver and golden daggers which appears, apart from the isolated West Balkan occurrence in Mala Gruda, only in the Aegean and the Near East. Other items like the golden head ornaments seem to be common to the Balkans and the Aegean, while axes made of exceptional stones or of silver during the first half of the 3rd millennium BC are concentrated on the area of the Vučedol culture. To use terms like “prestige goods” or “symbols of power” somewhat misses an important point inasmuch as the value of such objects was not inherent and fixed but had to be created by incorporating them in social practices through which prestige was affirmed, won or lost. Some of these practices were probably based on the conspicuous wearing or employing of the objects by the living, while others evidently requested the dedication of the objects to the dead or to supernatural powers. It is likely that an important part of the significance of these special objects rested on narratives linked to their “social life”, that means their region of origin and their previous owners. This also accounts for the movement of certain objects over wide distance, since M. Helms has demonstrated how the displaying of “exotic” items, in our case, for instance, the Lefkas head ornaments, the Mala Gruda dagger, or the Dietenhausen figurine, underlined the connection of the owner and his or her family to powerful and mysterious beings in distant lands. Although already in the early 3rd millennium BC certain objects were widely spread through the Mediterranean, I do not think that this was accomplished by a direct exchange between, for instance, peoples of the Cyclades and of Montenegro. As an alternative I propose a structure resembling the model of “inter-locking exchange networks” defined by M. Rowlands for the terrestrial trade of the European Bronze Age. This would mean that the large interaction-zones of the Aegean and Adriatic-Ionian region were subdivided by a mosaic of overlapping networks with different range. With the help of this structure raw materials and finished products could have moved over wide distances without a primary supplier and a final recipient ever getting into direct contact. The difference to earlier exchange structures of the Neolithic consisted in a new dimension of social inequality which was simultaneously the background and the outcome of the flow of new kinds of commodities. While archaeologically only finished products give evidence for the exchange, it is likely that raw materials like copper and gold provided important stimuli for the contacts. Even tin from possibly Balkan sources may have circulated in small amounts, since around 3000 BC the first bronze objects make their appearance in the West Balkans and in the Northern Aegean. The commodities may have spread, like in the kula-ring, through ritualized gift-exchange in the course of visiting expeditions headed by members of the elite. I assume that such contacts not only contributed to the dissemination of goods, but also of information about distant lands and their populations through tales told at the occasion of the visits. Whether it is appropriate to integrate the emerging structures of maritime connectivity in a Centre-Periphery-Model seems doubtful to me, at least not in a model which regards Greece as a “centre”. If one would really want to claim asymmetrical relations based on differing degrees of social complexity, during this period some regions of the Balkans and the Carpathian Basin would seem to represent much better candidates for “centres” than the Aegean. Not only did the Vučedol culture have the most dynamic copper metallurgy at that time in Europe, but we encounter in its mortuary and settlement evidence signs of social inequality which in Greece are only equalled by the R-graves, that is in the zone with the closest ties to the north. The next chronological horizon between 2500 and 2200 BC (Pl. V) is accompanied by profound changes in the Aegean. In Southern Greece during the so-called period of the corridor-houses of the second half of EH II we are confronted with the first examples of imposing architecture. To this category belong the corridor-houses themselves and the hitherto unique Circular Building of Tiryns, a huge tower with a diameter of about 28 m. In addition, we find the administrative use of seals, specialized storage-facilities, and settlement hierarchies, all signs pointing to an increase in social complexity. Some of these innovations probably were adopted from Anatolia or even the Levant, because just at that time we note an intensification of trans-Aegean contacts, which manifests itself not only in the westward spread of certain shapes of Anatolian fine table ware, but also in the first significant use of tin bronze in the Aegean. As Broodbank has pointed out, it is not difficult to envisage the Aegean during these centuries as being part of an early “world system”, which had the Near East during the late Early Dynastic and Akkad-period at its centre. At the same time in the western and central parts of the Mediterranean an exciting new pattern of connectivity unfolds. Beginning around 2500 BC Southern France, Sardinia, parts of the Tyrrhenian side of the Italian mainland and Sicily become part of the Bell Beaker phenomenon. The synchronicity of the North South spread of the Bell Beaker with the East-West diffusion of Anatolian table ware in the Aegean is remarkable. In both cases new kinds of drinking vessels originating in distant areas were accepted and integrated in local feasting customs in which they probably were employed as signs of social distinction. In light of the development after 2200 BC to which we will turn to soon, it would seem logical to assume that the exchange circuits in the Tyrrhenian and Aegean Sea were linked already at that time. Yet, it is difficult to find arguments supporting such a notion. As for the Bell Beaker phenomenon, it is striking that during its early stage it was concentrated on specific areas of the Tyrrhenian side of Italy. Whatever may have been exchanged in the Adriatic-Ionian region during that time, it doesn’t seem to have been the Bell Beakers, since along the Eastern Adriatic coast this vessel does not occur, while on the Adriatic side of Central and Southern Italy examples of true Bell Beakers are next to unknown. Moreover, in general the whole Adriatic-Ionian region between 2500 and 2200 BC has not yet yielded unequivocal signs for North-South connections comparable to the ones in the previous centuries. There is, however, one intriguing piece of evidence which may indeed point to some distant reflection of the Bell Beaker phenomenon in the Aegean. Already in 1923 St. Xanthoudides recognized that a group of small rectangular or oval stone objects with two, and in one case even four, perforations deriving from the vaulted tombs of the Mesara in southern Crete bear resemblance to the famous Bell beaker stone wrist-guards (Pl. IV:1-3). He nevertheless decided to interpret the implements as whetstones, and he may very well have been right, because with the exception of the example with four perforations, all other pieces are morphologically very simple. In Lerna similar stone objects proved to be typical for Lerna IV. E. Banks regarded it as unlikely that they had served as whetstones because she did not observe any traces which would point to such a use. She couldn’t exclude a function as wrist-guards, but found this likewise not plausible, since the objects were not associated with arrowheads. All in all, she opted in favor of an ornamental use. But even if this group of objects is related to Bell Beaker wrist-guards the decisive question would be to what chronological horizon this link would belong. As mentioned, the majority of pieces from Lerna date to EH III, while, due to the lack of closed deposits, the inventories of the Mesara tombs have a notoriously wide “error margin” ranging from EM I or II to the beginning of the Middle Minoan period. This means that the objects under discussion may all date to the time horizon between 2200 and 2000 BC during which we have ample evidence for interconnections between the Balkans, Italy and the Aegean. Indeed, extremely slender wrist-guards with two perforations resembling the so-called whetstones from Crete derive from chronological phases in Northern Italy (cf. Pl. IV:4), the Eastern Adriatic region and Eastern Central Europe (cf. Pl. IV:5) which are already contemporary with the Central European Early Bronze Age of the latest part of the 3rd millennium. While accordingly for the second chronological horizon the evidence for possible links between the Aegean, the West Balkans and the Central Mediterranean interaction zones is inconclusive, we are on much firmer ground to claim that during the third horizon between 2200 and 2000 BC wide parts of the Mediterranean were interconnected. The most important aspect within these far-reaching contacts is the expansion of the Cetina phenomenon from its centre in the Eastern Adriatic region and its hinterland to all coastal zones around the Adriatic and Ionian Sea (Pl. II-III, V). This phenomenon for a short time represented a common denominator for areas from the Caput Adriae in the North to the Maltese Islands and the Peloponnese in the South which before and after this time have followed very different cultural trajectories. Without going into details, it should be pointed out that in the last two decades it became evident that specific elements of shape and of the syntax, as well as the motives of incised and impressed decoration are shared by pottery groups deriving from the Peloponnese (cf. Pl. II:1.5.7.10; IIIa:1-2.5) the Cetina culture (cf. Pl. II:3-4.6.9.11.13-14) and the Tarxien Cemetery culture (cf. Pl. II:2.8; IIIa:3.6). During the last years new research has added significantly to the corpus of comparisons. This especially applies to the finds from the recent excavations in Olympia, whose long-distance relations have been thoroughly analyzed by J. Rambach. Outside of Southern Greece new evidence suggests that some of the forms of pottery which were thought to be restricted to only certain areas of the Cetina phenomenon have a wider distribution. The neck-handled amphora which until recently was known from Olympia (Pl. II:10), the West Balkans (Pl. II:13-14) and possibly from Malta is also attested, as shown by L. Cataldo, in the material from the chamber-tomb of Altamura-Casal Sabini in Apulia together with other examples of Cetina-pottery (Pl. II:12). The so-called Bass bowl with incised decoration, which was hitherto only common to the Peloponnese (Pl. II:1) and the Maltese Islands (Pl. II:2), seems to be represented by at least one example in the core-area of the Cetina culture among the finds from the tumulus 2 of the necropolis of Shkrel in Northern Albania (Pl. II:3). The vessel from Shkrel appears to be a mixture between an EH III form and a typical pedestal-footed vessel of the Cetina culture. In my opinion it belongs to a group of ceramic “hybrids” which are characterized by the blending of different pottery traditions and which can be found in the whole area of distribution of the Cetina phenomenon. In light of the extraordinary importance of the Cetina phenomenon for the emergence of new Mediterranean exchange patterns, a few words about its chronological position seem appropriate. In 1995 Ph. della Casa put forward a considerably earlier dating for the Cetina culture than was hitherto proposed, inasmuch as he correlated it with the earlier part of the Bell Beaker phenomenon between 2500 and 2200 BC. There can be little doubt that della Casa has rightly pointed to the insecurity surrounding the internal chronology of Cetina which stems from insufficient stratigraphic evidence and very few 14C-dates. Still, there are clear indications coming from outside the Eastern Adriatic region that what is called Cetina culture must at least partially be significantly later than suggested by della Casa. In Greece all contexts with Cetina-like pottery date to EH III in the sense of the classical definition by J.L. Caskey. According to 14C dates this phase cannot have started much earlier than 2200 BC (Pl. V). As regards the apsidal buildings of the Altis of Olympia which represent the crucial find complex of Cetina-type pottery in Greece, J. Rambach has recently demonstrated that the find assemblages with the clearest links to the Cetina culture belong to the later part of EH III which corresponds to the very end of the 3rd millennium BC. Thus, while Cetina-type pottery in Southern Greece appears from early EH III onwards, for instance in Lerna IV, at Korakou, Kolonna on Aegina and at the site of the New Museum of Olympia, it reaches its highest frequency shortly before 2000 BC. A late 3rd millennium date for Cetina is also supported by the situation in the other areas of its distribution where related finds appear in contexts contemporary with the late stage of the Bell Beaker phenomenon as well as the incipient Central European Early Bronze Age. In the latter regard, the connection between some of the characteristic features of Cetina-decoration and the so-called “symbolically decorated pottery” of the late Nagyrév culture in the central part of the Carpathian basin deserve special attention (Pl. IIIa:1.4). Admittedly, all this indirect evidence for dating the Cetina culture does not preclude the possibility that in its Eastern Adriatic core-area it began earlier, i.e. prior to 2200 BC, and this issue has to be clarified by a series of 14C dates. However, what the evidence from Greece seems to suggest is that the long-distance spreading of the Cetina phenomenon took place during the last two centuries of the 3rd millennium BC and that perhaps towards the very end of that millennium an intensification of the interconnections occurred. Again, it is difficult to reconcile the described exchange constellations in the Adriatic-Ionian region with the notion of the Aegean acting as the “centre” and the West Balkans and Italy as a “periphery”, but for other reasons than in the first chronological horizon. The first reason relates to the fact that the contacts coincide with one of the most profound upheavals in the prehistory of Greece. Most achievements in architecture and administration which had characterized the period of the corridor-houses disappear around 2200 BC, only to be found again on the Greek Mainland some 800 years later in Mycenaean times! At first sight it seems strange, that just during such “crisis years” a wide interaction zone in the Adriatic and Ionian Sea should come into being. In order to understand, why this nevertheless makes sense we get to the second point why it is problematic to conceive of the Balkans as a “periphery” during the last two centuries of the 3rd millennium BC. The different groups along the shores of the Adriatic-Ionian region which are related to the Cetina culture, have in common that they either replace earlier cultures or form alien elements amongst a differing cultural milieu. An example for the first category is the Tarxien Cemetery Culture of the Maltese Islands which bears no resemblance to the previous Temple Culture. To the second category belong sites like Rutigliano-Le Rene at the Apulian coast or Olympia in Elis. I regard all this as a reflection of activities of a seafaring population specialized in maritime exchange, which originated in the East Adriatic Region and spread along the shores of the Adriatic and Ionian Sea. In doing this, these “Argonauts of the West Balkans” took advantage of the crisis situation in regions like Malta and the Peloponnese, and occupied places which were of crucial importance for Mediterranean exchange. The emergence of the Cetina phenomenon goes along with a re-structuring of the exchange patterns in the Aegean in which some areas suffer a setback and others rise to new importance. That Crete belongs to the “winners” is documented, among other things, by the founding of the Minoan settlement on Kythera. As regards trans-Aegean trade we can be certain that it still flourished between 2200 and 2000 BC. To document the extent of exchange connections within the Eastern Mediterranean at that time I only want to mention the fragment of an imported flask of the EB IV period in Israel which was identified by E. Oren among the Early Bronze sherd material from Tiryns. It seems to me, that during the last centuries of the 3rd millennium BC we are confronted with a quantum-leap in Mediterranean connectivity. Besides the East-West-axis in the East Mediterranean and the North-South axis in the Adriatic-Ionian region the integration of the Maltese Islands for the first time document the cross-linking of exchange circuits from the Tyrrhenian Sea to the East Mediterranean. This provided the background for a hitherto unknown flow not only of metals and other commodities, but also of ideas and information about the Mediterranean and its populations. To underline that the range of interconnections goes far beyond the realm of pottery, I only want to mention four unusual groups of items: 1. Bossed-bone plaques appearing between Sicily and the Troad. The spreading of these enigmatic objects with still unexplained function is likely to be an outcome of the described patterns of connectivity. While the examples from Sicily, Troy and Malta cannot be precisely dated, the bossed-bone plaque from Lerna derives from an EH III context and the long-known piece from Altamura-Casal Sabini in Apulia is now known to have been found in a chamber-tomb which also yielded Cetina-pottery; 2. Bone toggles, which are distributed between Central Europe and Southern Greece. The appearance of these seemingly humble objects seems to be a late 3rd millennium BC feature linked to the Bell Beaker phenomenon and transmitted to Greece via Italy; 3. Violin-shaped terracotta figurines occurring from the West Balkans to Southern Greece. The only example of this type of figurine from Lerna IV (Pl. IV:6) shows a painted EH III decoration. It cannot be related to Early Cycladic stone figurines of similar shape, since these had already disappeared more than 800 years earlier. Identical terracotta figurines, albeit without decoration, have been found in ritual figurine deposits in two tumuli in Shtoj (cf. Pl. IV:8.10) in Northern Albania and in Kuča Rakića (cf. Pl. IV:7.9) in Montenegro; 4. Bronze/copper spear-heads with two hafting slots found between the Aegean and Central Europe. The only example of this Aegean-type of weapon occurring outside of the Mediterranean is the piece from a hoard of the Únětice culture of the incipient Central European Early Bronze Age in Kyhna in Saxonia. Since the chemical composition of the metal of the Kyhna spear-head corresponds to the one of the majority of clearly local objects from the hoard the object is likely to have been manufactured in Central Europe. It seems, that either an Aegean type of weapon was emulated or that an Aegean spear-head mould reached the Únětice region. In light of all this, the late 3rd millennium BC seems to have been of crucial importance for the development of maritime connectivity and for the process of the mental mapping of the Mediterranean. But seemingly, this pattern of connectivity did not represent the direct precursor of the trade patterns of the emerging Minoan palatial civilization. On the contrary, after the disintegration of the Cetina phenomenon around 2000 BC roughly four centuries had to pass until, during the formative stage of the Mycenaean period, we find again evidence for an exchange axis linking the Central Mediterranean with Greece. As one mayor reason for a possible interruption of exchange in the Central Mediterranean I suspect the social and economic dynamics on Crete which led to the focusing of trade activities on the Aegean, the Near East and Egypt. In closing, I would like to come back to the interpretation of the emergence of new structures of Mediterranean exchange and pose a question whether it is coincidental that all this got underway at the beginning of the 3rd millennium BC, i.e. contemporary with the start of the Early Bronze Age in the Near East. In the course of this paper, I repeatedly spoke out against explaining the described structures in the framework of Centre-Periphery models, and this mainly for two reasons. First, because they are usually based on notions of economic dependency for which we have no evidence at that early date; secondly, because such models often tend to ascribe the “active” role to “civilizations”, while the allegedly under-developed populations of the “peripheries” are denied agency and are more or less reduced to passive providers of raw material. While I would reject the simplistic use of centre-periphery models, I find it conceivable that in a more subtle way indeed forms of early globalization were involved in the patterns we encounter. What I envisage is a structure resembling the one already sketched by A. Harding, some sort of “decentralized globalization”, in which independently from each other in different parts of the Mediterranean interaction zones came into being, guided by different motifs and interests. But in order to gain a new quality they had to be cross-linked, and in this process the demand for raw materials created by Early Near Eastern civilizations may have served as an impulse which was transmitted like in a chain-reaction through already existing trade networks, thus indirectly contributing to the development of new exchange patterns. But the described trajectory of the development of trade relations also underlines the impact of the agency of societies of the so-called periphery. If I am not mistaken, we have to qualify the idea of associating prehistoric migrations from the Balkans into the Aegean with notions of war and destruction. The population movement involved in the Cetina phenomenon of the late 3rd millennium BC was not the reason, but the effect of the break-down of the EH II-culture, and these peoples were descendants of Balkan populations who had been the exchange partners of the Aegean for more than 500 years and who with these contacts had contributed to the widening of the mutual perception of the surrounding world. Through the activity of the sea-faring population of a West Balkan origin for a short time a new dimension of cross-linking of different parts of the Mediterranean emerged which, even if it did not lead directly to the East-West contacts of the incipient Mycenaean period, nevertheless formed a crucial threshold in the long-term process of the unfolding of the Mediterranean. * I would like to thank Sveta Matskevich, the draughtswoman of our institute, for her invaluable help in the preparation of the plates. R.A. CROSSLAND and A. BIRCHALL (eds), Bronze Age Migrations in the Aegean: Archaeological and Linguistic Problems in Greek Prehistory. Proceedings of the First International Colloquium on Aegean Prehistory, Sheffield (1973); E. ARDITIS (ed), Acta of the 2nd International Colloquium on Aegean Prehistory. The First Arrival of Indo-Europeans Elements in Greece (1972). See for instance R. CHAPMAN, Emerging Complexity: The Later Prehistory of South-East Spain, Iberia and the West Mediterranean (1990) 18-34 with earlier literature. M.W. HELMS, Ulysses’ Sail. An Ethnographic Odyssey of Power, Knowledge, and Geographical Distance (1988) 3-65; EAD., Craft and the Kingly Ideal: Art, Trade, and Power (1993) 46-51. For the ancient Near East see M. LIVERANI, Prestige and Interest. International Relations in the Near East ca. 1600-1100 B.C. (1990) 51-65, for the general link between maps and world views cf. U. SCHNEIDER, Die Macht der Karten. Eine Geschichte der Kartographie vom Mittelalter bis heute (2004) 7-32. Especially in F. BRAUDEL, The Mediterranean and the Mediterranean World in the Age of Philip II (1976); for an assessment of the ideas of Braudel see P. HORDEN and N. PURCELL, The Corrupting Sea: A Study of Mediterranean History (2000) 36-43. Y. SHAVIT, “The Mediterranean World and ‘Mediterraneanism’: The Origins, Meaning, and Application of a Geo-Cultural Notion in Israel,” Mediterranean Historical Review 3:2 (1988) 96-105. HORDEN and PURCELL (supra n. 5) 530. SHAVIT (supra n. 6) 105; A.B. KNAPP and E. BLAKE, “Prehistory in the Mediterranean: The Connecting and Corrupting Sea,” in E. BLAKE and A.B. KNAPP (eds), The Archaeology of Mediterranean Prehistory (2005) 6-7. D. ZOHARY and M. HOPF, Domestication of Plants in the Old World (1994) 137-140, 144-148, 152-155. ZOHARY and HOPF (supra n. 9) 141-143, 148-150, 155-156. H.G. NIEMEYER, “Die Phönizier am Mittelmeer. Neue Forschungen zur frühen Expansion,” in E.A. BRAUN-HOLZINGER and H. MATTHÄUS (eds), Die nahöstlichen Kulturen und Griechenland an der Wende vom 2. zum 1. Jahrtausend v. Chr. Kontinuität und Wandel von Strukturen und Mechansimen kultureller Interaktion. Kolloquium des Sonderforschungsbereiches 295 “Kulturelle und sprachliche Kontakte” der Johannes Gutenberg-Universität Mainz, 11.-12. Dezember 1998 (2002) 177-190. HORDEN and PURCELL (supra n. 5) 43. J.E. ROBB and R.H. FARR, “Substances in Motion: Neolithic Mediterranean ‘Trade’,” in BLAKE and KNAPP (supra n. 8) 25-27. F. PRONTERA (ed), Tabula Peutingeriana: le antiche vie del mondo (2003); SCHNEIDER (supra n. 4) 19-23; HORDEN and PURCELL (supra n. 5) 11. P. JANNI, La mappa e il periplo. Cartografia antica e spazio odologico (1984) 79-99. K. LYNCH, The Image of the City (1960) 1-13; D. CANTER, The Psychology of Place (1977) 49-78; P. GOULD and R. WHITE, Mental Maps (1986) 1-30; SCHNEIDER (supra n. 4) 7-9. M. PARKER PEARSON and C. RICHARDS, “Ordering the World: Perceptions of Architecture, Space and Time,” in M. PARKER PEARSON and C. RICHARDS (eds), Architecture and Order: Approaches to Social Space (1994) 3-5. HELMS (supra n. 3, 1988) 66-130; EAD. (supra n. 3, 1993) 91-127; K. KRISTIANSEN, “Kontakte und Reisen im 2. Jahrtausend v. Chr. ,” in St. BURMEISTER (ed), Rad und Wagen. Der Ursprung einer Innovation. Wagen im Vorderen Orient und Europa (2004) 443-446. NIEMEYER (supra n. 11) 180. HORDEN and PURCELL (supra n. 5) 123-172. HORDEN and PURCELL (supra n. 5) 123. Cf. M. MARAZZI, “The Mycenaeans in the Western Mediterranean (17th – 13th c. BC),” in N.Ch. STAMPOLIDIS (ed), Sea Routes…From Sidon to Huelva: Interconnections in the Mediterranean 16th – 6th c. BC (2003) 110-115. C. BROODBANK and T.F. STRASSER, “Migrant Farmers and the Neolithic Colonization of Crete,” Antiquity 65 (1991) 237-239; M. ÖZDOĞAN, “The Expansion of the Neolithic Way of Life: What we know and what we do not know,” in C. LICHTER (ed), How Did Farming Reach Europe? Anatolian-European Relations from the Second Half of the 7th through the First Half of the 6th Millennium Cal. BC. Proceedings of the International Workshop, Istanbul, 20-22 May 2004 (2005) 13-27; N. EFSTRATIOU, “Tracing the Story of the First Farmers in Greece – A Long and Winding Road,” in ibid. 143-153; M. BUDJA, “The Transition to Farming in Southeast Europe: Perspectives from Pottery,” Documenta Praehistorica 28 (2001) 27-42; C. PERLÈS, “An Alternate (and Old-fashioned) View of Neolithisation in Greece,” Documenta Praehistorica 30 (2003) 99-110. See also the evidence for maritime mobility already at the very beginning of the Near Eastern Neolithic in the 9th millennium BC as evidenced by recent discoveries on Cyprus: E. PELTENBURG, “Introduction: a Revised Cypriot Prehistory and Some Implications for the Study of the Neolithic,” in E. PELTENBURG and A. WASSE, Neolithic Revolution: New Perspectives on Southwest Asia in Light of Recent Discoveries on Cyprus. Papers from a Conference Organized by the Council for British Research in the Levant in Collaboration with the Department of Antiquities, Cyprus, 20th to 23rd September 2001, Drousha Village, Cyprus (2004) XI-XVII; B. FINLAYSON, “Island Colonization, Insularity or Mainstream?,” in ibid. 15-21. BROODBANK and STRASSER (supra n. 22) 233-242. C. BROODBANK, An Island Archaeology of the Early Cyclades (2000) fig. 23; D. WOOLNER, “Graffiti of Ships at Tarxien, Malta” Antiquity 31 (1957) 60-67. BROODBANK (supra n. 24) 101-102. M. WEDDE, Towards a Hermeneutics of Aegean Bronze Age Ship Imagery (2000) 90. Chr. A. TELEVANTOU, “Strophilas – A Neolithic Settlement on Andros,” in ‛Oρίζων. A Colloquium on the Prehistory of the Cyclades, 25-28 March 2004 McDonald Institute for Archaeological Research, University of Cambridge (in print). BROODBANK and STRASSER (supra n. 22) 239-242. Revealingly, from the Early Bronze Age site of Korfi t’Aroniou on Naxos as well as from the recently discovered Chalcolithic site of Strophilas on Naxos come depictions of boats carrying animals: BROODBANK (supra n. 24) 99; fig. 23, TELEVANTOU (supra n. 27). R.H. TYKOT, “Chemical Fingerprinting and Source Tracing of Obsidian: The Central Mediterranean Trade in Black Gold,” Accounts of Chemical Research 35 (2002) 618-625. R. TORRENCE, Production and Exchange of Stone Tools. Prehistoric Obsidian in the Aegean (1986) 93-114. Interestingly, in Italy a significant use of copper can be observed only as of the second half of the fourth millennium BC, i.e. at the time of the decline of copper production and use in the Balkans and the Carpathian Basin: D. COCCHI GENICK, Manuale di Preistoria III. L’età del rame (1996) 197-205. J. MARAN, “Neue Ansätze für die Beurteilung der Balkanisch-Ägäischen Beziehungen im 3. Jahrtausend v. Chr. ,” in P. ROMAN (ed), The Thracian World at the Crossroads of Civilizations I. Proceedings of the Seventh International Congress of Thracology, Constanţa – Mangalia – Tulcea 20-26 May 1996 (1997) 177-178; figs. 6-8; ID., “Die Badener Kultur und der ägäisch-anatolische Bereich. Eine Neubewertung eines alten Forschungsproblems,” Germania 76 (1998) 508-512. For the chronological position of the Vučedol culture see J. MARAN, Kulturwandel auf dem griechischen Festland und den Kykladen im späten 3. Jahrtausend v. Chr. Studien zu den kulturellen Verhältnissen in Südosteuropa und dem zentralen sowie östlichen Mittelmeerraum in der späten Kupfer- und frühen Bronzezeit (1998) 311-320, 331-342, 349-350; L. NIKOLOVA, The Balkans in Later Prehistory. Periodization, Chronology and Cultural Development in the Final Copper and Early Bronze Age (Fourth and Third Millennia BC) (1999) 218-220. For overviews on this culture see A: DURMAN, Vučedol: Three Thousand Years. Muzejski proctor, Zagreb, Jezuitski trg 4, 21.7.-31.8.1988 (1988); ID., The Vučedol Orion and the Oldest European Calendar (2000); N. TASIĆ. Eneolithic Cultures of Central and West Balkans (1995) 75-84. In MARAN (supra n. 35) 330-333 I mistakenly followed the then prevalent research opinion and assigned the central graves of Mala Gruda and Velika Gruda to the post-Vučedol period. Thanks to the analysis of M. Primas this assessment was disproved and it became evident that both graves are earlier and belong to the hitherto little known Montenegrinian variant of the Vučedol culture proper, see postscript in MARAN, op.cit. 330 footnote 243. M. PAROVIĆ-PEŠIKAN and V. TRBUHOVIĆ, “Iskopavanja tumula ranog bronzanog doba u Tivatskom polju,” Starinar N.S. 22 (1971) 129-141; M. PRIMAS, Velika Gruda I. Hügelgräber des frühen 3. Jahrtausends v. Chr. Im Adriagebiet – Velika Gruda, Mala Gruda und ihr Kontext (1996) 17-18, 75-91; L. SAVELJIĆ-BULATOVIĆ and P. LUTOVAC, Zlatno doba Crne Gore (2003) 15-16, 27-28. SAVELJIĆ-BULATOVIĆ and LUTOVAC (supra n. 37) 29-32. M. PRIMAS, “Waffen aus Edelmetall,” JRGZM 35 (1988) 176; see also PRIMAS (supra n. 37) 75-88; H. CIUGUDEAN, “Zur frühen Bronzezeit in Siebenbürgen im Lichte der Ausgrabungen von Ampoiţa, jud. Alba,” PZ 66 (1991) 94. PRIMAS (supra n. 37) 76-77; fig. 6.3. Contrary to the often held view that the R-graves should be dated to EH III or even later times, there are actually only scant indications that some of these graves might be later than the late EH II. For the chronological assessment of the R-graves and earlier literature see K. ZACHOS, Agios Dimitrios. A Prehistoric Settlement in the Southwestern Peloponnesos: The Neolithic and Early Helladic Periods (Diss. Boston University, 1987) 186-187, 270-271; MARAN (supra n. 35) 102-104; Hitherto, three golden rings from the pithos grave R15b (W. DÖRPFELD, Alt-Ithaka  Beilage 60,4) were cited as comparisons for the pieces from the Montenegrinian tumulus burials and from other sites in the Balkans and the Carpathian Basin: cf. CIUGUDEAN (supra n. 40) 94; PRIMAS (supra n. 37) 84; MARAN, op.cit. 330-331. Only recently it became clear, that there are six golden rings of the type Lefkas among the finds of the R-graves: I. PAPAGEORGIOU, “Χρυσό ενώτιο της Πρώιμης Εποχής του Χαλκού στις συλλογές του Μουσείου Μπενάκη,” in A. VLACHOPOULOS and K. BIRTACHA, Αργοναύτης – Τιμητικός τόμος γιά τον καθηγητή Χρίστο Γ. Ντούμα από τους μαθητές του στο Πανεπιστήμιο Αθηνών (1980-2000) (2003) 216 fig. 9. PAPAGEORGIOU, op.cit. 219-220 assigns all six rings to the pithos grave R15b and postulates a similar head ornament as in the Montenegrinian graves. She states that previous authors erroneously were led to believe that three such rings came from grave R15b because only these were depicted in the publication (PAPAGEORGIOU, op.cit. 216 with footnote 14). Unfortunately, it is not that simple, because she fails to notice that in the German text of the original publication it is twice mentioned that three rings were found in R15b: W. DÖRPFELD and P. GOESSLER, “Die Gräber in der Nidri-Ebene,” in DÖRPFELD, op.cit. 235; P. GOESSLER, “Die Einzelfunde der Ausgrabungen,” in ibid. 288-289. Thus, the question arises whether the excavators forgot to refer to the other three examples from R15b, or whether these were found in a different context. Indeed, K.L. ZACHOS and A.S. DOUZOUGLI, Λευκάδα. Ιστορική-Αρχαιολογική επισκόπηση μέσα από τα Εκθέματα του Αρχαιολογικού Μουσείου (2003) 35-37 divide the six rings into two groups of three golden rings each, which they assign to the pyre in tumulus R4 and the pithos grave R15b respectively, but they do not specify on what information this is based. In the original publication only one golden ring is mentioned from the pyre in R4 and this ring seems to belong to a different type: DÖRPFELD and GOESSLER, op.cit. 227; GOESSLER, op.cit. 288; Beilage 61,b1. In order to solve the problems of attribution one has to wait for the new study of the R-graves which is currently undertaken by Dr. I. Kilian-Dirlmeier. M. PRIMAS, “Velika Gruda – Ein Grabhügel des frühen 3. und 2. Jahrtausends v. Chr. in Montenegro,” ArchKorrBl 22 (1992) 52; EAD. (supra n. 37) 77-79. Golden rings of the type Lefkas are known, besides from the two Montenegrinian tumulus burials of Velika Gruda and Boljevića Gruda, also from tumulus burials in Ampoiţa in Transylvania and from Tărnava in Northwest Bulgaria: see CIUGUDEAN (supra n. 40) 94. Whether the connection between the Eastern Adriatic region and Greece in the first half of the 3rd millennium BC expresses itself in other elements than the few discussed precious objects has to be investigated. PRIMAS (supra n. 37) 63-65 makes the interesting suggestion that the elaborate stamp decoration (“false Kerbschnitt”) which is so typical for the Vučedol culture in the West and Central Balkans is related to similar modes of pottery decoration occurring in contemporary Aegean contexts, most prominently in the Cyclades. Since I do not see any striking correspondences in form and decoration between Vučedol and Aegean pottery it is premature to decide whether these similarities are merely fortuitous or based on a actual relations. PAPAGEORGIOU (supra n. 42) 211-215; figs. 1-8. For a comprehensive discussion of the Anatolian origin of the Mala Gruda dagger see MARAN (supra n. 34) 175; ID. (supra n. 35) 331-332. The Mala Gruda dagger and its comparisons are linked to the Type 4a of the typology of Anatolian Early Bronze Age daggers developed by D.B. STRONACH, “The Development and Diffusion of Metal Types in Early Bronze Age Anatolia,” AnatSt 7 (1957) 98-99, although I would classify them as a separate sub-group within this type. Characteristic for this sub-group are the slightly sloping and very short shoulders, the pronounced mid-rib and the trapezoid or rectangular hilt-plate which, in the case of the Mala Gruda dagger, is topped by a central lobe with a third rivet-hole. Besides the two depicted daggers from Bayındırköy (Pl. 1:3-4) in Northwest Anatolia there is a third such dagger from the same site: STRONACH, op.cit. fig. 1:14; pl. 7:b1. H.Z. KOŞAY, Les fouilles d’Alaca Höyük. Enterprises par la Societe d’Histoire Turque. Rapport preliminaire sur les travaux en 1937-1939 (1951) pl. 183:2; STRONACH (supra n. 47) 99. PRIMAS (supra n. 40) 174-175; S. HANSEN, “Helme und Waffen der Bronzezeit in der Sammlung Axel Guttmann,” in H. BORN and S. HANSEN, Helme und Waffen Alteuropas. Band IX: Sammlung Axel Guttmann (2001) 37. But see K. BRANIGAN, “Prehistoric Relations between Italy and the Aegean,” BPI N.S. 75 (1966) 97-109; ID., “Halberds, Daggers and Culture Contact,” Origini 5 (1971) 47-57; PRIMAS (supra n. 37) 61. In my opinion, the metal and pottery forms cited by Branigan and Primas are morphologically not that distinctive to exclude a fortuitous convergence. There is a discussion on whether connections between cultures of Italy, the Balkans and the Aegean existed at an even earlier date, namely during the late fourth millennium BC, at the time of the transition between the Late Chalcolithic and the incipient Early Bronze Age in the Aegean, see recently M. CULTRARO, “Aspetti dell’Eneolitico dell’Italia Centrale nel quadro dei rapporti con la penisola Balcanica e l’Egeo,” in Atti della XXXIV Riunione Scientifica Preistoria e Protostoria della Toscana, Firenze, 29 Settembre – 2 Ottobre 1999 (2001) 215-229 with earlier literature. S. HANSEN, “Vom Tigris an die Lahn. Eine mesopotamische Statuette in Hessen,” in S. HANSEN and V. PINGEL (ed), Archäologie in Hessen. Neue Funde und Befunde. Festschrift für Fritz-Rudolf Herrmann zum 65. Geburtstag (2001) 47-53. HANSEN (supra n. 51) 51-53. S. SHERRATT, Catalogue of Cycladic Antiquities in the Ashmolean Museum. The Captive Spirit (2000) 29, 38-42, pls. 13-14; J. THIMME (ed), Kunst und Kultur der Kykladeninseln im 3. Jahrtausend v. Chr. Badisches Landesmuseum Karlsruhe, Ausstellung unter dem Patronat des International Council of Museums ICOM im Karlsruher Schloss vom 25. Juni – 10. Oktober 1976 (1976) 369 Nos. 451-452; 570-573; D. COLLON, First Impressions. Cylinder Seals in the Ancient Near East (1987) 141. For the chronological position of the finds from Kapros Grave D, which do not represent a closed deposit, but nevertheless are chronologically homogenous and date to Early Cycladic I, see J. RAMBACH, Kykladen II. Die frühe Bronzezeit - Frühbronzezeitliche Beigabensittenkreise auf den Kykladen: relative Chronologie und Verbreitung (2000) 153, 221-222. PRIMAS (supra n. 40, 1988) 179-181; HANSEN (supra n. 49) 50-59; ID., (supra n. 51) 52-53. In the Carpathian Basin and the Balkans during the first half of the 3rd millennium the favorite weapon was the shaft-hole axe and not the dagger, which was so common in the Aegean and the Near East. This juxtaposition of a “Balkan-Carpathian axe circle” and an “Aegean-Near Eastern dagger circle” explains why the isolated occurrence of a dagger in Mala Gruda is a long-distance import from the south: J. MARAN, “Der Depotfund von Petralona (Nordgriechenland) und der Symbolgehalt von Waffen in der ersten Hälfte des 3. Jahrtausends v. Chr. zwischen Karpatenbecken und Ägäis,” in R.M. BOEHMER and J. MARAN (eds), Lux Orientis. Archäologie zwischen Asien und Europa (2001) 277-283. What other weapons of Aegean or Near Eastern origin may have reached the north during that period is unclear. The Hungarian National Museum in Budapest bought in the late 19th cent. a silver dagger with a rounded hilt-plate, which on morphological grounds is likely to be of Aegean origin and of 3rd millennium BC date. Unfortunately the place of its discovery is unknown and therefore it is possible that it was brought to Hungary in modern times through the collecting of antiquities: A. MOZSOLICS, Bronzefunde des Karpatenbeckens. Depotfundhorizonte von Hajdúsámson und Kosziderpadlás (1967) 173; T. KOVÁCS, “Bronzezeitliche Schmuckgegenstände, Waffen und Goldschätze,” in T. KOVÁCS and P. RACZKY (eds), Prähistorische Goldschätze aus dem Ungarischen Nationalmuseum. Ausstellung im Museum für Vor- und Frühgeschichte, Archäologisches Museum Frankfurt am Main, 16.10.1999 – 9.1.2000 (1999) 58-59; fig. 31; HANSEN (supra n. 49) 37. Besides the silver axe from Mala Gruda, there is the pair of silver axes from Stari Jankovci and the four silver axes from a hoard of unknown Balkan or Carpathian provenance in the A. Guttmann collection in Berlin: J. BALEN and S. MIHELIĆ, “Par srebrnih sjekira iz Starih Jankovaca,” Opuscula Archaeologica (Zagreb) 27 (2003) 85-95 and this volume; S. HANSEN (supra n. 49) 13-23. The axe from Boljevića Gruda consists of beautiful green granite: SAVELJIĆ-BULATOVIĆ and LUTOVAC (supra n. 37) 17, 29-31. While in the Near East during the first half of the 3rd millennium BC daggers made of precious metal relatively often appear, axes of precious metal are extremely rare and, as far as I know, restricted to the Early Dynastic Royal Cemetery of Ur. From Grave 580 there is a shaft-hole adze and from Grave 755 a shaft-hole axe as well as a very unusual double-fenestrated axe, all of which allegedly consist of electrum: C.L. WOOLLEY, Ur Excavations, Volume II. The Royal Cemetery (1934) pls. 155:b (U.10025), 156:1 (U.10018), 165 (U.9339); see Hansen (supra n. 49) 38. I would like to thank Prof. P. Miglus (Heidelberg) for providing me with information on precious metal weapons in the Near East. A. APPADURAI, “Introduction: Commodities and the Politics of Value,” in A. APPADURAI (ed), The Social Life of Things. Commodities in Cultural Perspective (1986) 16-29; J. BENNET, “Iconographies of Value: Words, People and Things in the Late Bronze Age Aegean,” in J.C. BARRETT and P. HALSTEAD (eds), The Emergence of Civilisation Revisited (2004) 90-101. HELMS (supra n. 3, 1988) 20-130. M.J. ROWLANDS, “Modes of Exchange and the Incentives for Trade, with Reference to Later European Prehistory,” in C. RENFREW (ed), The Explanation of Culture Change: Models in Prehistory (1973) 596-599; MARAN (supra n. 35) 437. A. DURMAN, “Tin in Southeastern Europe?,” Opuscula Archaeologica (Zagreb) 21 (1997) 7-13; MARAN (supra n. 34, 1997) 177. Of the six analyzed metal objects from Sitagroi phase IV, which should date to the late 4th millennium BC, three, a pin and two metal fragments, have tin contents between 0.69 and 5.9%, while the sole analyzed object attributable to Phase Va, which dates to the early 3rd millennium BC, shows 0.9% tin: C. RENFREW and E.A. SLATER in: E.S. ELSTER and C. RENFREW (eds), Prehistoric Sitagroi: Excavations in Northeast Greece, 1968-1970. Volume 2: The Final Report (2003) 300-307; for the chronological position of Sitagroi IV and Va see MARAN (supra n. 35) 124-127, 338-344; NIKOLOVA (supra n. 35) 187-191, 199-202. RENFREW and SLATER, op.cit. 313 cast doubts on the validity of the early tin bronzes from Sitagroi IV and Va, but their skeptical attitude seems to be based mainly on the consideration that these would be isolated examples of the earliest bronze objects in the Aegean. But other indications suggest that the Sitagroi evidence fits very well in a general picture of an early horizon of a sporadic use of tin in the early 3rd millennium BC in this zone: J.D. MUHLY and E. PERNICKA, “Early Trojan Metallurgy and Metals Trade,” in J. HERRMANN (ed), Heinrich Schliemann. Grundlagen und Ergebnisse moderner Archäologie 100 Jahre nach Schliemanns Tod (1992) 311. From Thermi on Lesbos, town I, comes a pin which seems to consist of tin-bronze: C. DESCH in W. LAMB, Excavations at Thermi in Lesbos (1936) 215; J.D. MUHLY, “Beyond Typology: Aegean Metallurgy in its Historical Context,” in N.C. WILKIE and W.D.E. COULSON (eds), Contributions to Aegean Archaeology: Studies in Honor of William A. McDonald (1985) 119; F. BEGEMANN, S. SCHMITT-STRECKER, and E. PERNICKA, “The Metal Finds from Thermi III – V: A Chemical and Lead-Isotope Study,” Studia Troica 2 (1992) 223. The early Troy I-settlement of Beşik-Yassıtepe has yielded two bronze objects: MUHLY and PERNICKA, op.cit. 311. Among the furnishings of the central grave of Velika Gruda is a unique type of knife or razor made of tin bronze: PRIMAS (supra n. 37) 97-98; figs. 7.5,M2. For a thorough assessment of the early use of tin see C.F.E. PARE, “Bronze and the Bronze Age,” in C.F.E. PARE (ed), Metals Make the World Go Round: The Supply and Circulation of Metals in Bronze Age Europe. Proceedings of a Conference Held at the University of Birmingham in June 1997 (2000) 1-32. J.W. LEACH and E. LEACH, The Kula. New Perspectives on Massim Exchange (1983). I. ECSEDY, “Ásatások Zók-Várhegyen (1977-1982),” Janus Pannonius Múzeum Évkönyve 27 (1982) 89-91; A. DURMAN, “Metalurgija vučededolskog kulturnog kumpleksa,”, Opuscula Archaeologica (Zagreb) 8 (1983) 1-87; PRIMAS (supra n. 37) 151-159. MARAN (supra n. 35) 193-198, 232-240, 299-305, 432-443. MARAN (supra n. 35) 420-424. BROODBANK (supra n. 24) 283-287. For a recent overview on the present state of research relating to the Bell Beaker phenomenon see F. NICOLIS (ed), Bell Beakers Today. Pottery, People, Culture, Symbols in Prehistoric Europe. Proceedings of the International Colloquium, Riva del Garda (Trento, Italy), 11-16 May 1998 (2001). MARAN (supra n. 35) 435-437. See the distribution map in F. NICOLIS and E. MOTTES (eds), Simbolo ed enigma. Il bicchiere campaniforme e l’Italia nella preistoria europea del III millennio a.C. (1998) 14. St. XANTHOUDIDES, The Vaulted Tombs of the Mesará. An Account of Some Early Cemeteries of Southern Crete (1924) 20; pls. 23:787-788, 39:1060, 43:a(lower row), 54:1899-1900.2008-2011. For the morphological differentiation of Bell Beaker wrist-guards see E. SANGMEISTER, “Zwei Neufunde der Glockenbecherkultur in Baden-Württemberg,” Fundberichte aus Baden-Württemberg 1 (1974) 115-118; fig. 8. While V. HEYD, Die Spätkupferzeit in Süddeutschland (2000) 283-286 rightly points out that wrist-guards with two perforations already appear from the beginning of the Bell Beaker phenomenon, they nevertheless are most often found during its later part. E.C. BANKS, The Early and Middle Helladic Small Objects from Lerna (Diss. University of Cincinnati, 1967) 214-219; pl. 8 (lower row). BANKS (supra n. 71) 218. XANTHOUDIDES (supra n. 70) 20 on the other hand has noted “…traces of rubbing on one side…” of a particularly long example from Koumasa (our Pl. 4:1). In order to gain additional information concerning the function of such stone implements it is clearly necessary to re-examine them and to determine the origin of traces of use-wear on them. K. BRANIGAN, The Tombs of Mesara. A Study of Funerary Architecture and Ritual in Southern Crete, 2800-1700 B.C. (1970) 16-27. Cf. B. GOVEDARICA, Rano bronzano doba na području istočnog Jadrana (1989) 142, pl. 30:5-6, 31:8; J. VLADÁR, “Zur Problematik der Glockenbecherkultur im Mitteldonauraum,” in J.N. LANTING and J.D. VAN DER WAALS (eds), Glockenbecher Symposion, Oberried 1974 (1976) 222 fig. 4:7-8.11-12; A. ASPES and L. FASANI, “Einflüsse der mitteleuropäischen Glockenbecherkultur in der Poladakultur,” in ibid. 326 fig. 3:6-9.12-20; J. ONDRAČEK and L. ŠEBELA, “Pohřebiště nitrianské skupiny v Holešově,” in Studie muzea kroměřížska ’85 (1985) pls. 20:18, 26:16, 28:17, 30:24, 33:25; J.-W. NEUGEBAUER and Chr. 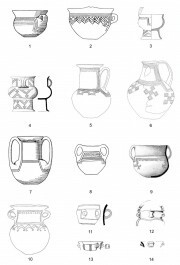 NEUGEBAUER-MARESCH, “Bell Beaker Culture in Austria,” in NICOLIS (supra n. 67) figs. 1:7, 3:3; L. USAI in NICOLIS and MOTTES (supra n. 69) 303 fig. 12 (no. 78); M. NOVOTNÁ and B. NOVOTNÝ, “Die Chłopice-Gruppe, ” in N. TASIĆ (ed), Kulturen der Frühbronzezeit des Karpatenbeckens und Nordbalkans (1984) pl. 81:11; R. SCHREIBER-KALICZ, “Komplex der Nagyrév-Kultur, ” in ibid. pl. 51:4. For the Cetina phenomenon in Southern and Southeastern Europe see MARAN (supra n. 34, 1997) 172-174; ID. (supra n. 35) 18-24, 277, 323-330, 369-372, 404-410, 445-446 with earlier literature on the Cetina culture and on the EH III incised and impressed pottery of Olympia and other sites. For the Tarxien Cemetery culture see J.D. EVANS, The Prehistoric Antiquities of the Maltese Islands: A Survey (1971) 149-166, 224-225. The vessel reproduced as our Plate IIIa:6 was found in the temple of Tarxien, but may well belong not to the temple phase, but rather to the Tarxien Cemetery culture. J. RAMBACH, “Bermerkungen zur Zeitstellung der Apsidenhäuser in der Altis von Olympia,” in BOEHMER and MARAN (supra n. 55) 327-332; ID., “Olympia. 2500 Jahre Vorgeschichte vor der Gründung des eisenzeitlichen griechischen Heiligtums,” in H. KYRIELEIS (ed), Olympia 1875-2000. 125 Jahre Deutsche Ausgrabungen. Internationales Symposion, Berlin 9.-11. November 2000 (2002) 191-200; ID., “Olympia im ausgehenden 3. Jahrtausend v. Chr. : Bindeglied zwischen zentralem und östlichem Mittelmeerraum,” in E. ALRAM-STERN, Die Ägäische Frühzeit. 2. Serie: Forschungsbericht 1975-2002. 2. Band: Die Frühbronzezeit in Griechenland mit Ausnahme von Kreta (2004) 1199-1242. EVANS (supra n. 75) pl. 54:10. L. CATALDO, “La tomba di Casal Sabini e i rinvenimenti funerari tra Eneolitico ed età del Bronzo nel territorio di Altamura (Bari): Le facies culturali indigene e i contatti transadriatici e con il Mediterraneo Orientale,” Origini 20 (1996) 118; fig. 3:8. In contrast to the vessels from Olympia the amphora from this Apulian chamber-tomb has four handles. B. JUBANI, “Kultura e bronzit të hershëm në tumat e Shkrelit,” Iliria 25 (1995) 57, 70; pl. 3:1. Cf. J.B. RUTTER, Lerna, a Preclassical Site in the Argolid. Volume III: The Pottery of Lerna IV (1995) 367-368; ill. S-12:3 (shape XII.3). Already RUTTER (supra n. 80) 646-654 has observed that EH III pottery is characterized by the combination of indigenous Helladic with Cycladic and Anatolian pottery traditions. In my opinion, this ceramic “syncretism” also comprises West Balkan and Italian traits and is not restricted to Greece (see already MARAN [supra n. 35] 373-374 with footnote 653). As examples I would like to mention: first, the fragment of a vessel from Tiryns which combines pottery features of West Balkan and South Italian origin, MARAN, ibid.. 371; pl. 31:3; second, a tankard from Korakou which blends elements of West Anatolian and West Balkan origin, J.B: RUTTER, “A Group of Distinctive Pattern-decorated Early Helladic III Pottery from Lerna and its Implications,” Hesperia 51 (1982) 471-474; pl. 100:39; third, Gray Minyan vessels from Olympia which exhibit morphological and/or stylistic links to the West Balkans, RAMBACH (supra n. 76, 2001) 327; ID. (supra n. 76, 2004) 1228; fourth, a jug from Gioia del Colle in Apulia which seems to combine features of West Anatolian and West Balkan origin, F.G. LO PORTO, “La tomba di Cellino San Marco e l’inizio della civiltà del Bronzo in Puglia,” BPI N.S. 71-72 (1962-1963) 216-217; fig. 21; MARAN (supra n. 35) 374; finally, the vessel from Shkrel (our Pl. II:3) which shows traits of West Balkan and Greek origin, see JUBANI (supra n. 79). Ph. DELLA CASA, “The Cetina Group and the Transition from Copper to Bronze Age in Dalmatia,” Antiquity 69 (1995) 565-575. See S. FORENBAHER and T. KAISER, “Grapčeva spilja i apsolutno datiranje istočnojadranskog neolitika,” Vjesnik za arheologiju i historiju dalmatinsku 92 (2000) 18; figs. 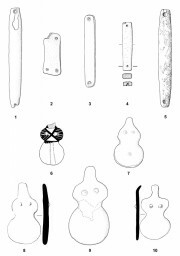 6-7; table 2; T. KAISER and ST. FORENBAHER, “Adriatic Sailors and Stone Knappers: Palagruža in the 3rd millennium BC,” Antiquity 73 (1999) 314-316. J.L. CASKEY, “The Early Helladic Period in the Argolid,” Hesperia 29 (1960) 293-297. S. MANNING, The Absolute Chronology of the Aegean Early Bronze: Archaeology, Radiocarbon and History (1995) 151-153. DELLA CASA (supra n. 82) 573 arrived at a significantly earlier dating for EH III because he followed the dates given in P. WARREN and V. HANKEY, Aegean Bronze Age Chronology (1989) 124, 169 without realizing that their definition of this phase differs from the one of J.L. Caskey insofar as it encompasses under the term “Early Helladic IIIA” also the find assemblages of the Lefkandi 1 type which, as many argue, should mainly be correlated with the second half of EH II: cf. J.B. RUTTER, Ceramic Change in the Aegean Early Bronze Age. The Kastri Group, Lefkandi I, and Lerna IV: A Theory Concerning the Origin of Early Helladic III Ceramics (1979); MANNING, op.cit. 51-63, 81-86; E. CHRISTMANN, Die deutschen Ausgrabungen auf der Pevkakia-Magula in Thessalien II. Die frühe Bronzezeit (1996) 289-300; MARAN (supra n. 35) 33-35, 56-60, 97-98, 139-150, 153-156. RAMBACH (supra n. 76, 2001) 328-333; ID. (supra n. 76, 2004) 1222-1228. Rambach thus convincingly refuted the opinion of RUTTER (supra n. 81) 480-488; ID. (supra n. 80) 643-644 and MARAN (supra n. 35) 18-23 that the pottery groups from the apsidal buildings of the Altis represent an earliest phase of EH III. RUTTER (supra n. 81) 484-485; RUTTER (supra n. 80) 627-634, 643-644; W. GAUSS and R. SMETANA, “Bericht zur Keramik und Stratigraphie der Frühbronzezeit III aus Ägina Kolonna,” in ALRAM-STERN (supra n. 76) 1105-1106; pl. 8:7; M. KOUMOUZELIS, The Early and Middle Helladic Periods in Elis (Diss. Brandeis University, 1980) 125-183. Since this incised and impressed pottery of early EH III-date already exhibits affinities to the decoration of the pottery of the Cetina culture proper, I see no need (contrary to RAMBACH [supra n. 76, 2001] 332) to suggest that it was contemporary with the elusive “Protocetina”-phase in the Eastern Adriatic region, GOVEDARICA (supra n. 74) 113-128. MARAN (supra n. 35) 370-373, 387-388, 400-402, 408-410; G.L. CARANCINI, A. CARDARELLI, M. PACCIARELLI and R. PERONI, “L’Italia,” in C. BELARDELLI and R. PERONI (eds), The Colloquia of the XIII International Congress of Prehistoric and Protohistoric Sciences Forlì (Italia) 8-14 September 1996.Vol. XI: The Bronze Age in Europe and the Mediterranean (1996) 77-78. R. SCHREIBER, “Szimbolikus ábrázolások korabronzkori edényeken,” ArchErt 111 (1984) 3-28. MARAN (supra n. 34, 1997) 172-173; ID. (supra n. 35) 327. MARAN (supra n. 35) 444-446, 453-455. F. RADINA, “Insediamenti della prima età dei Metalli in territorio di Rutigliano (Bari)”, in A. CIANCIO (ed), Archeologia e territorio: L’area Peuceta. Atti del seminario di studi Gioia del Colle, Museo Archeologico Nazionale, 12-14 novembre 1987 (1989) 15-17, 22-24; figs. 9-11; MARAN (supra n. 35) 370-371; RAMBACH (supra n. 76, 2004) 1231-1232. J.N. COLDSTREAM and G.L. HUXLEY, “The Minoans of Kythera,” in R. HÄGG and N. MARINATOS (eds), The Minoan Thalassocracy: Myth and Reality. Proceedings of the Third International Symposium at the Swedish Institute in Athens, 31 May – 5 June, 1982 (1984) 107; MARAN (supra n. 35) 444. E.D. OREN, “Interconnections between the Southern Levant and the Aegean at the End of the Early Bronze Age,” ErIsr 27 (2003) 10-17 (Hebrew Section); fig. 1. The continuity of exchange transactions between East and West is also underlined by what I have called the „Euboia-Magnesia group“ which dates to the time of Lefkandi 3 and, during the later EH III, is characterized by a relatively high amount of light-coloured wheelmade ware linked to West Anatolian pottery of the Troy IV-period, see MARAN (supra n. 35) 99-101, 280-282, 419-420. CASKEY (supra n. 84) 297; BANKS (supra n. 71) 459-461. CATALDO (supra n. 78) 114-119, 152-153; figs. 3:6.8, 5. MARAN (supra n. 35) 296-297. MARAN (supra n. 35) 329-330; B. GOVEDARICA, “Hronološki položaj i porijeklo violinskih idola iz Štoja,” in B. ČOVIĆ (ed), Zbornik Radova posvećenih akademiku Alojzu Bencu (1991) 105-112; A. KOKA, “Tuma Nr. 6 e varrezës së Shtojit,” Iliria 20:1 (1990) 37-45.; SAVELJIĆ-BULATOVIĆ and LUTOVAC (supra n. 37) 25-26. W. COBLENZ, “Ein frühbronzezeitlicher Verwahrfund von Kyhna, Kr. Delitzsch,” Arbeits- und Forschungsberichte der Sächsischen Bodendenkmalpflege 30 (1986) 68-69; fig. 2:1; S. GERLOFF, “Zu Fragen mittelmeerländischer Kontakte und absoluter Chronologie der Frühbronzezeit in Mittel- und Westeuropa,” PZ 68 (1993) 73-74, 91-92; MARAN (supra n. 35) 446-447; pls. 53, 79. R. KRAUSE, “Zur Entwicklung der frühbronzezeitlichen Metallurgie nördlich der Alpen,” in B. HÄNSEL (ed. ), Mensch und Umwelt in der Bronzezeit Europas. Abschlußtagung der Kampagne des Europarates: Die Bronzezeit: das erste goldene Zeitalter Europas an der Freien Universität Berlin, 17. – 19. März 1997 (1998) 178-179, 182. KRAUSE (supra n. 103) 182; SHERRATT (supra n. 53) 71. J. MARAN, “Dynamik dank Handel und Metallurgie,” Archäologie in Deutschland, Heft 1 (2000) 19. MARAZZI (supra n. 21) 110-112; J. MARAN, “Wessex und Mykene. Zur Deutung des Bernsteins in der Schachtgräberzeit Südgriechenlands,” in B. HÄNSEL and E. STUDENÍKOVÁ (eds), Zwischen Karpaten und Ägäis. Neolithikum und ältere Bronzezeit. Gedenkschrift für Viera Němejcová-Pavúková (2004) 54-56. W.-D. NIEMEIER, “Creta, Egeo e Mediterraneo agli inizi del bronzo tardo,” in M. MARAZZI, S. TUSA and L. VAGNETTI (eds), Traffici Micenei nel Mediterraneo. Problemi storici e documentazione archeologica. Atti del Convegno di Palermo, 11-12 maggio e 3-6 dicembre 1984 (1986) 245; M.H. WIENER, “The Nature and Control of Minoan Foreign Trade,.” in N.H. GALE (ed), Bronze Age Trade in the Mediterranean. Papers Presented at the Conference held at Rewley House, Oxford, in December 1989 (1991) 325-326. G.J. STEIN, “World Systems Theory and Alternative Modes of Interaction in the Archaeology of Culture Contact,” in J.G. CUSICK (ed), Studies in Culture Contact. Interaction, Culture Change, and Archaeology (1998) 225-232; M. DIETLER, “Consumption, Agency, and Cultural Entanglement: Theoretical Implications of a Mediterranean Colonial Encounter,” in ibid. 295-301. A.F. HARDING, European Societies in the Bronze Age (2000) 414-422; fig. 13.1 (lower map). Maran, J. "Seaborne Contacts between the Aegean, the Balkans and the Central Mediterranean in the 3rd Millennium BC – The Unfolding of the Mediterranean World." 21 May. 2008. In: Horejs, B. - Pavúk, P. (eds. ): Aegean and Balkan Prehistory. http://aegeobalkanprehistory.net/index.php?p=article&id_art=13 (24 Apr. 2019).